A rare and exciting discovery: A bulla (seal impression) and a 2,600-year-old stamp bearing Hebrew names were uncovered in the City of David. The artifacts were discovered inside a public building that was destroyed during the destruction of the First Temple and were uncovered in archaeological excavations of the Givati Parking Lot in the City of David National Park in Jerusalem. The dig was conducted by archeologists from the Israel Antiquities Authority and Tel Aviv University.According to Prof. Yuval Gadot of Tel Aviv University and Dr. Yiftah Shalev of the Israel Antiquities Authority who were responsible for the dig, these special artifacts were found inside a large public building, that was destroyed in the sixth century BCE – likely during the Babylonian destruction of Jerusalem in 586 BCE. Large stone debris, burnt wooden beams and numerous charred pottery shards were discovered in the building, all indications that they had survived an immense fire. The importance of this building can be discerned, among other things, from its size, the finely cut ashlar stones from which it was built and the quality of the architectural elements found in the layers of destruction – for example, remnants of a polished plaster floor, which had collapsed and caved into the floor below. A rare and exciting discovery: A bulla (seal impression) and a 2,600-year-old stamp bearing Hebrew names were uncovered in the City of David. The artifacts were discovered inside a public building that was destroyed during the destruction of the First Temple and were uncovered in archaeological excavations of the Givati Parking Lot in the City of David National Park in Jerusalem. The dig was conducted by archeologists from the Israel Antiquities Authority and Tel Aviv University. According to Prof. Yuval Gadot of Tel Aviv University and Dr. Yiftah Shalev of the Israel Antiquities Authority who were responsible for the dig, these special artifacts were found inside a large public building, that was destroyed in the sixth century BCE – likely during the Babylonian destruction of Jerusalem in 586 BCE. Large stone debris, burnt wooden beams and numerous charred pottery shards were discovered in the building, all indications that they had survived an immense fire. The importance of this building can be discerned, among other things, from its size, the finely cut ashlar stones from which it was built and the quality of the architectural elements found in the layers of destruction – for example, remnants of a polished plaster floor, which had collapsed and caved into the floor below. The stamp and bulla, which are about one centimeter in size, were deciphered by Dr. Anat Mendel-Geberovich of the Hebrew University of Jerusalem and the Center for the Study of Ancient Jerusalem, who, according to the script, dates them to the middle of the seventh century to the beginning of the sixth century BCE. The title “Servant of the King” (Eved HaMelech) is appears often in the Bible to describe a high-ranking official close to the king. This title appears on other stamps and seal impressions that were found in the past. This seal impression is the first archaeological evidence of the name Biblical Nathan-Melech. Dr. Mendel-Geberovich notes that the fact that this official was mentioned by his first name alone indicates that he was known to all, and there was no need to add his family lineage. Bullae were small pieces of clay impressed by personal seals, used in ancient times to sign letters. While the parchment that they sealed didn’t survive the fires that devastated ancient Jerusalem, the bullae, which are made of ceramic-like material, were preserved, leaving evidence of the correspondence and those behind them. 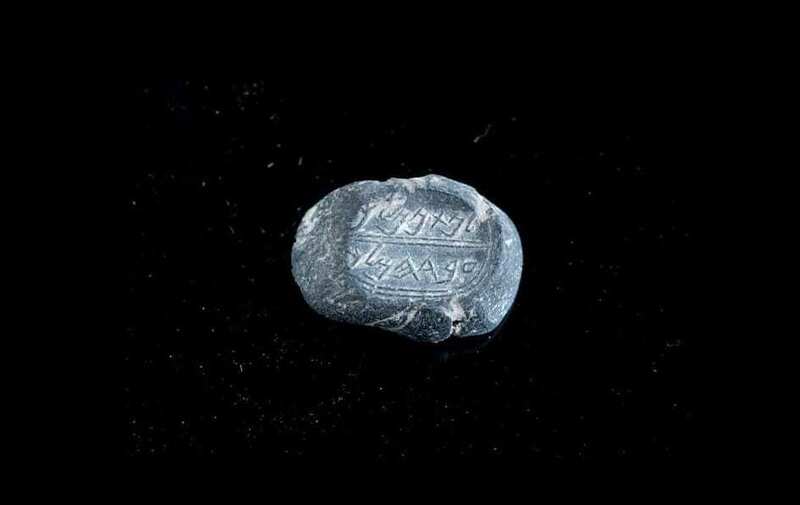 A stamp-seal was also in discovered the same place, made of bluish agate stone, engraved with the name – “(belonging) to Ikar son of Matanyahu” (LeIkar Ben Matanyahu). According to Dr. Mendel-Geberovich, “The name Matanyahu appears both in the Bible and on additional stamps and bullae already unearthed. However, this is the first reference to the name “Ikar,” which was unknown until today.” She believes that despite the literal meaning of Ikar which is farmer, it most likely refers to a private individual with that name as opposed to a description of his occupation. It is still unclear who this person was. Private stamps were used to sign documents, and were often set in signet rings carried by their owners. In ancient times these stamps noted the identity, lineage and status of their owners. Both of these artifacts will be presented in full in the Israel Exploration Journal, the archaeological journal published by the Israel Exploration Society.